I was listening to ds106 auto DJ and came across the fun I had with Rowan Peter in Melbourne as he pleaded that George Siemens go down under yo go ice skating. 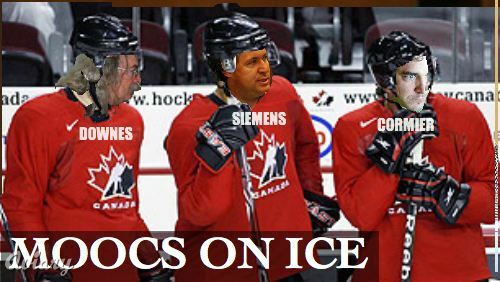 I recalled us conceptualizing the entire Canadian team (Downes, Siemens, and Cormier) to come perform a MOOCS on Ice show. This seemed to deserve a visual. For the graphic above, I had to do in Aviary, which actually provides a decent amount of editing (layers, selection tools). And the reason for doing this? None worth mentioning. Now, how do I make this a ds106b assignment? It’s easy to idolize professional sports, its uniforms, its code language, its appearance of abilities above our ordinary lives. Create a visualize that inserts people you know into an image of a professional sports team or redesign a logi, jersey to represent the common person. Ha ha! 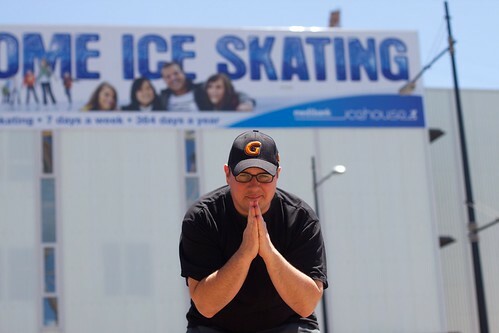 I remember broadcasting my #SkateWithGeorge plea with you on DS106radio at the Icehouse! Good fun! Looking at that photo, I now notice that I was wearing my ‘G-for-George’ cap too! Hmmm…how can we make MOOCS on ice a DS106 assignment? Not sure, but it made me think of the DS106 hockey jerseys I designed for the DS106’ers who headed off for Northern Voice 2011. Maybe that’s the assignment, design a uniform for your ultimate fantasy team? an audio assignment could be a recording of a live radio broadcast from a short sequence of play from a game your fictional team is playing. a design assignment where you design swap cards for each player of your team.